DRM Logistics can become, or even complement, your logistics department. Whether you partially or fully delegate your transport needs, DRM Logistics allows you to benefit from its large pool of suppliers and purchasing power. When we handle your shipments, we can manage every aspect with DRM Logistics’s renowned professionalism and commitment to excellence. Our role as a carrier and freight broker is to guarantee you that the TL or LTL (truckload or less-than-truckload) cargo you ship or receive arrives in excellent condition and on time — without the need for you to handle any shipment details. DT Transport is adequately insured and complies with government standards for vehicle maintenance and driver behaviour. DT Transport has the permits and licenses to act as a carrier and freight broker in North America. We also have insurance required by government agencies, ensuring full coverage for the cargo that you entrust to us. 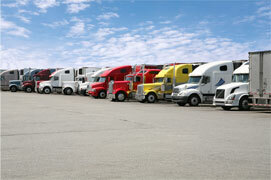 DRM Logistics has access to over 3,000 providers across North America.